ROAD Fighting Championship announces that ROAD FC 050 will take place on November 3, 2018 for the first time in the city of Daejeon, South Korea at the Daejeon Chungmu Gymnasium. 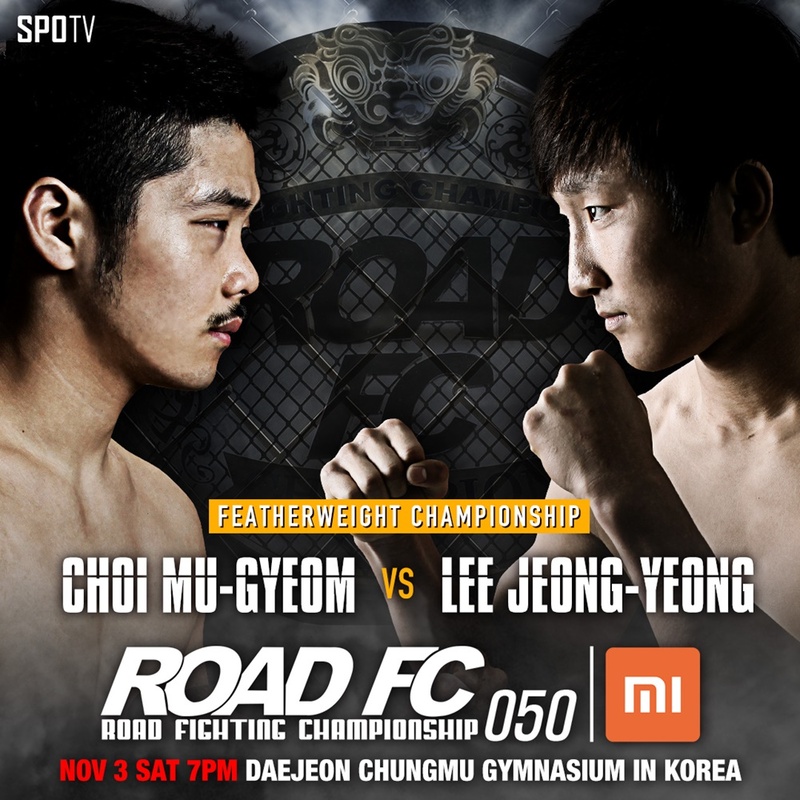 ROAD Featherweight Champion Choi Mu-Gyeom will make his fourth title defense against top contender Lee Jeong-Yeong. Choi Mu-Gyeom (8-4, Choi Mu-Gyeom Gym) won the Featherweight title in 2014 following his entry in the ROAD FC Featherweight Tournament. In his final match against stand out Kwon Bae-Yong, he was the underdog, but he surprised everyone with his well-rounded skills and his incredible defense. Choi has now made the most title defenses of any ROAD FC Champion, three: Seo Doo-Won, Marlon Sandro, and Murat Kazgan. Lee Jeong-Yeong (5-1, Ssen Gym) has become the standout in the featherweight division with a balance of skills in striking and grappling. At ROAD FC 046, he rematched Kim Se-Yong for the Challenger's right. Lee was able to put Kim on the back foot with hard punches, one of which finally slammed him sprawling on his rear, and the ref had to pull Lee off to stop the bout in the first round. He had avenged his only loss in stunning fashion. Champion Choi is 28 years old and in the prime of his career. Challenger Lee is just 22, and his future looks very bright. Choi versus Lee will be an incredible performance between two talented and well-rounded fighters, showcasing real Korean MMA!